A Nextbase iN-car camera 402G costing £150 has won a comparative test of 14 in car 'dashcams' conducted by The Consumers Association. Launched in February 2014, the Nextbase 402G was a Best Buy in the July 2014 Which? test. With a plague of car insurance scams such as ‘crash for cash’, forward facing car cameras are becoming increasingly popular amongst British drivers. Consumers Association Which? recently launched an investigation to find out which are the best on the market. Reviewing 14 different cameras, testing them for their video quality, intrusiveness on space, ease of use and price tag, the camera that came out on top was the Nextbase iN-car camera 402G. TheWhich?report compared the Nextbase 402G to cameras from GoPro, Mio and Garmin (to name but a few) and the 402G was particularly noted for its price-tag, ease of removal and use, and superior video quality. The Nextbase iN-car camera 402G retails at £149.99 and is available from Halfords. The Nextbase InCarCam™ 402G Professional captures every moment of a journey in 1080p High Definition quality video. It has a 140 degree ultra wide angle 6G (6 layer sharp lenses) lens to capture everything in the driver's field of vision, night and day. 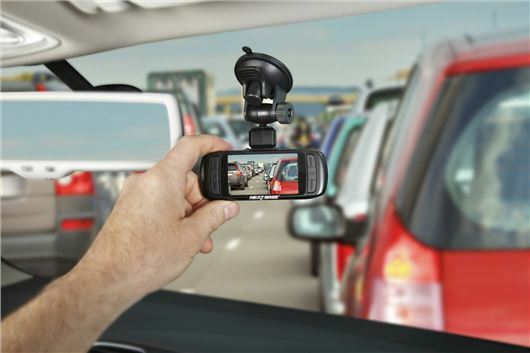 So even if an accident happens with a motorist changing lanes, you'll capture it all. The Nextbase InCarCam 402G is an essential independent witness. It will automatically capture and save footage of an incident which can be vital to provide to your insurance company to prove a claim was not your fault. The InCarCam™ 402G can also be your witness to capture unsafe or unscrupulous drivers and make sure you are not left out of pocket with your insurer. With the inbuilt G force sensor you are able to prove that you swerved, braked and show the force of an impact. Furthermore with the inbuilt GPS you can log your journey on Google Maps™, prove your speed and show exactly where an incident occurred with full road names, which can be key to resolving an insurance claim quickly and easily.